Back in 2010 I flew out to California to see Accept at the House of Blues with California's legendary Ruthless opening the show. The band at the time had Dark Angel's Jim Durkin on guitar. At that show they spoke of working on a new album. In the time between then and putting the album out, Durkin returned to Dark Angel and was replaced by ex-Hirax guitarist Dave Watson. All-in-all it's the band's first album in three decades. Their last output was "Metal Without Mercy" (1984) and the album "Discipline Of Steel" (1986). Along with the "They Rise" album the band have also included the "Metal Without Mercy" E.P. as a bonus. 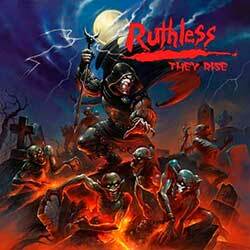 Ruthless delivers a solid heavy metal album with touches of speed and thrash metal mixed in. The album opens with a barnstormer titled "Defender" that recalls the glory of Hirax's awesome "New Age of Terror". This is followed-up by an old school, fist-pumping heavy metal track called "Laceration". This is the type of heavy metal that made bands like Metal Church, Vicious Rumors and Heretic legends. The song opens with a short acoustic intro before the main riff of the song kicks in. Sammy DeJohn's powerful vocal style reminds me a bit of Phil Rind from Sacred Reich while at other times he reminds me of Mike Torres of Heretic fame. "Hangman" is another of those up-tempo tracks that reminds me of "New Age of Terror"-era Hirax. Other tracks such as the melodic "Time Waits" draw more than a little influence from the early 80's New Wave of British Heavy Metal movement. This particular song is a ballad, though not a sappy pop metal ballad. Think more along the lines of "Beyond the Realms of Death" type ballad. There is even a bit of a punk influence on the short "Frustration". As for the 5-song EP from 1984, the style isn't that far removed from the new album. The roots of the band are obviously in the NWOBHM movement. The songs have solid musicianship and surprisingly, decent production. DeJohn's vocal style weaves about from a high-pitched metal scream to a snotty punk sneer. It's great that the band decided to include these tracks as a free bonus on the CD. The cover art is fantastic as well and deserves to be on the 12" format. The CD size doesn't do it justice.